In 2011 we inaugurated The Manton Memorial Organ. 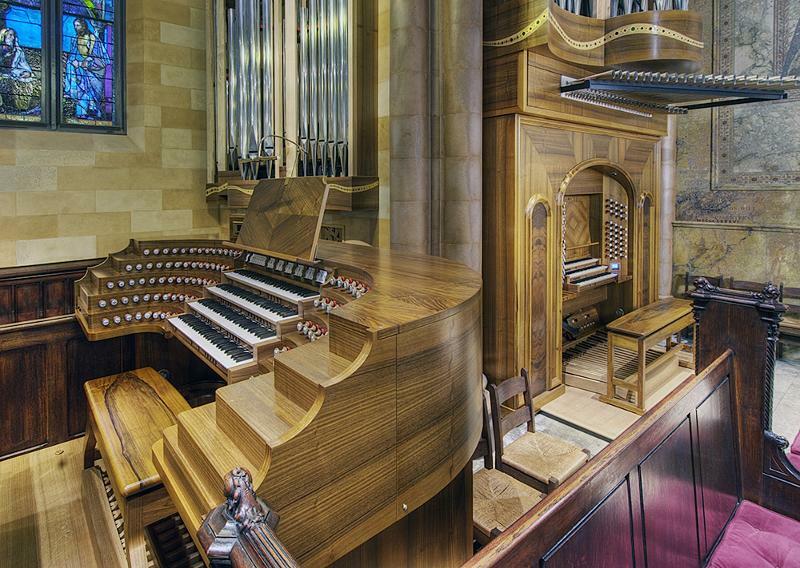 Built by Pascal Quoirin of St. Didier, France, it is the first French-built organ ever installed in New York City, and is already widely considered one of the most significant organs of our time. Full-length recitals are given throughout the year by some of the greatest organist in the world. In addition to the concerts, we invite you to join us Sundays at the 11:00am service when major organ music is played each week (come early for the Preludial music at 10:45-10:50!) The music for each Sunday’s service is listed on our website https://www.ascensionnyc.org by Thursday or Friday each week. Last Sunday I played music by Jehan Titelouze, organist at Rouen Cathedral from 1588 until his death in 1633. Today we hear music from the same cathedral a half century later. Jacques Boyvin was probably born in Paris and received his education there. In 1674 he was appointed the organist at Rouen Cathedral at the age of 25 years, and remained there until his death. Titelouze lived and worked in what would be called the Transitional Period between the Renaissance and the Baroque. His music reflects that period; and, as Organist of the Cathedral, he oversaw the installation of a new instrument in 1600 by Crespin Carlier, considered the greatest builder of the day. Boyvin, in his turn, lived during the middle of the French Baroque, and was responsible for the installation of a major instrument by Robert Clicquot in 1689. Boyvin published two organ books. Today’s pieces come from the First Organ Book published in 1689. It contains eight suites, each in a different “Ton” or church mode, the “keys” of the Middle Ages and Gregorian Chant. The Third Suite begins with the Plein jeu a 2 choeurs. Here the full principal chorus of the Grand-Orgue division is contrasted with the lighter principal chorus of the Positif. The music for each division corresponds to the sound: the light Positif has more ornaments and passages, whereas the Grand-Orgue’s music is broader and more sustained. The Fugue is indeed a four-part contrapuntal piece, with the theme passed around from one voice to the next. In the French Baroque it was customary to play this on one or more trompette stops. Today I am using one trompette stop of the Grand-Orgue and one of the Positif coupled together. The Dessus de tierce en vitesses, et accords is exactly what it says: a solo in the upper hand (Dessus) played on a combination of stops which includes a tierce (1 3/5’), and the music features fast passages (vitesses) and chordal ones (accords). I don’t actually know another piece quite like this one. I find the contrast between the fast scales, the single-voice aria-like music, and the sections with two or more parts in the right hand quite rich and fascinating. The next two movements form a meditative pair using the same solo stop, but in different registers, almost making it sound like two different stops. The Recit de cromhorne is a sweet aria for this remarkable stop in its soprano register. In the following movement, the Cromhorne en taille, the cromhorne now sings very profoundly in the tenor (taille) register. This beautiful piece is the emotional high-point of the suite. The concluding Grand Dialogue, bold and impressive, calls for all the trompettes, bombardes, clairons, and cornets of the organ (the Grands Jeux). I use all of them except for the chamades (the horizontal trumpets) which I will save for the Postlude. This Dialogue is different than others, because, instead of chordal sections, or melody with accompaniment, it is in a quasi-fugal style, with the fugue theme passed around from one part to the next.